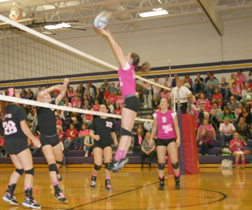 The Blissfield varsity volleyball team defeated the LCAA rival Onsted Wildcats at home Oct. 15. The Lady Royals defeated the Wildcats in five sets, 25-18, 19-25, 25-15, 22-25 and 17-15 in an exciting finish that went down to the wire. Blissfield’s trip to the County Tournament resulted in victories over Britton Deerfield 25-13 and 25-9, Hudson 25-9 and 25-7, and Lenawee Christian 25-16 and 25-14. The thorn in the side of the Royals proved to be the host Maples as they defeated Blissfield in two matches, 18-25 and 15-25 and then 21-25 and 21-25. The Britton Deerfield varsity volleyball squad went 1-2 in pool play before losing to host Adrian in the gold bracket of the County Tournament Saturday. The Lady Patriots lost to Blissfield 13-25 and 9-25 and Adrian 17-25 and 12-25 in the first two rounds of pool play, before defeating Hudson 25-14 and 25-12. After qualifying for the gold bracket, BD was defeated by Adrian in the first round 10-25 and 16-25. For details on these outings, please see the Oct. 23, 2013, edition of The ADVANCE.